With dozens of apps available in the major two stores (App Store and Android Google Play), some of them not free, decide which is the best app teleprompter or which one will best fit your needs, it’s complicated. We have therefore prepared this next review to help you a bit and make your life easier with one amazing teleprompter app called BIGVU. What is BIGVU all about? With BIGVU, anyone with no video skills can create compelling videos for video marketing, social media, training, news, sales pitches & corporate communication. So it is an iOS and Android app that combines both teleprompting and video making. Designed with neat user interface and well-packed features, BIGVU is one easy-for-anyone app! 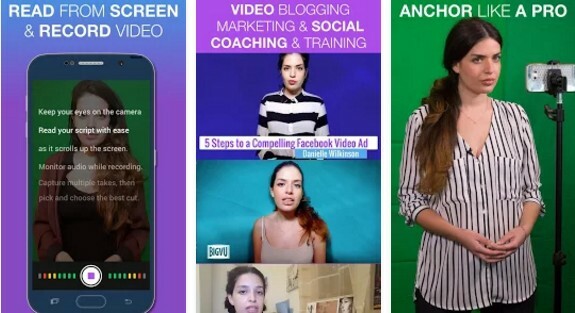 If you want to transform photos, video shots, and tweets into stunning video sequences in less than 3 minutes, then BIGVU is the perfect app for you. It lets you script, shoot, cut, caption, and post videos wherever you like. The app features a teleprompter video recorder, a newsroom with a text editor, an automatic video maker for video titling, an option to change a green background into a virtual set, an option to compose videos from photos, video scenes and tweets, and so much more. You can download BIGVU for free and then get one of the 2 different subscriptions, it’s all up to you. Click the links below, read more info and enjoy!